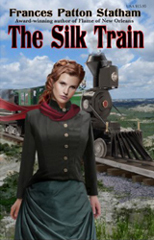 The Northern Pacific train, with its valuable cargo of raw silk, was a magnet for train robbers. And when it came under attack by outlaws, one of its passengers, noblewoman Anya Fodorsky, made a desperate decision. Anya’s traveling companion, a gentle schoolmarm, had been killed, and Anya switched their clothes and identities. As Miss Sarah Macauley, she could run from her murderous husband and her gilded, treacherous life… and into Matt Bergen’s empire. Settled in the Dakota Territory boomtown of Medora, “Sarah” thought she’d found the perfect refuge – until Matt, himself, came too close to unraveling her secrets. There were dangers here on the frontier – and the laws of survival were harsh.